The aim of this study was to compare the enamel and dentin microhardness of teeth with TF (Thylstup-Fejerskov) scores of 0,1,2,3 and 4, using microindentation method. In this study we used Hanemann VEB Zeiss Jena device. The results demonstrated a decrease of the microhardness of the teeth having dental fluorosis when compare with healthy teeth, but the association was statistically significant only in the internal third of the enamel of the teeth having TF scores of 2,3 and 4 and at the enamel-dentin junction of the teeth with TF 4. Banerjee A, Sherriff M, Kidd EA, Watson TF. A confocal microscopic study relating the autofluorescence of carious dentine to its microhardness. Br. Dent. J. 1999; 187:206-10. Caldwell RC, Muntz ML, Gilmore RW, Pigman W. Microhardness studies of intact surface enamel. J. Dent. Res. 1957; 36:732-8. Craig RG, Peyton FA. The microhardness of enamel and dentin. J. Dent. Res 1958; 37:661-8. Craig RG, Gehring PE, Peyton FA. Relation of structure to the microhardness of human dentin. J. Dent. Res. 1959; 38:624-30. Fejerskov O, Thylstrup A, Larsen J. Clinical and structural features and possible pathogenic mechanisms of dental fluorosis. Scand. J. Dent. Res., 1977, 85:510-534. Fejerskov O, Silverstone LM., Melson B, Moller IJ. The histological features of fluorosed human dental enamel. Caries. Res., 1975, 9:190-210. Fukuda K, Higashi S, Miake K, Matsui T. Studies on microhardness of the human third molar, especially that of the enamel. Bull. Tokyo Dent. Coll. 1975; 16:11-33. Meredith N, Sherriff M., Setchell D.J, Swanson SAV. Measurement of the microhardness and Young's modulus of human enamel and dentine using an indentation technique. Archs. Oral Biol. 1996; 41:539-545. Rautiola CA, Craig RG. The microhardness of cementum and underlying dentin of normal teeth and teeth exposed to periodontol disease. J. Periodontol. 1961; 32:113-23. Phillips RW, Swartz ML. Effect of fluorides on hardness of tooth enamel. J. Am. Dent. Assoc. 1948; 37:1-13. Saunsbury PH, Atkinson HF. An investigation into the hardness of human enamel. Part II - Studies of deciduous and permanent teeth. Br. Dent. J. 1953; 94:251-3. Shannon IL, Keuper JB. 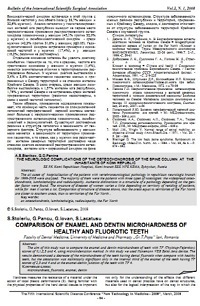 Microhardness of human dentin: baseline values and effects of fluorides. J. Miss. Dent. Assoc. 1976; 56:118. Thylstrup A, .Fejerskov O. Clinical appearance of dental fluorosis in permanent teeth in relation to histologic changes. Commun. Dent. Oral Epidemiol. 1978; 6: 315-328.